Emmylou Harris is an American singer-songwriter and musician. In addition to her work as a solo artist and bandleader, both as an interpreter of other composers' works and as a singer-songwriter, she is a sought-after backing vocalist and duet partner, working with numerous other artists including Gram Parsons, The Band, Linda Ronstadt, Roy Orbison, Dolly Parton, Mark Knopfler, Guy Clark, Willie Nelson, Bob Dylan, Rodney Crowell, and Neil Young. Many country singers have achieved success by crossing over into the lucrative pop market. The dulcet-voiced Emmylou Harris has done just the opposite; she culls songs from pop and rock and transforms them into pure country fare. Harris, one of the most popular singers in Nashville, is praised on every side for the respect she holds for traditional country music. To quote Alanna Nash in Esquire, the performer "has not only carried on the mission of taking pure, traditional country to a hip, pop audience, but through her own artistry and integrity has helped raise the music to a new position of respectability, carving an identity for herself unique in all of country music." In Country Music U.S.A., Bill C. Malone observed that Harris seems dedicated to the preservation of older country music, the sound of the Carter Family, Hank Williams, and George Jones. Still, Malone writes, "Harris is a true eclectic, borrowing from many styles. Her concerts and LPs contain a mixture of contemporary and traditional material, rock-flavored songs and Appalachian-sounding ballads, and modern country-and-western numbers." It is Harris' vocal abilities that guarantee her an audience, no matter the style of her presentation. A Time correspondent characterizes her singing as "more ... melancholy Appalachian bluegrass than ... western swing," adding: "Despite its range, her voice is most telling because of its feathery delicacy, an almost tentative dying fall capable of stirring deep emotions." Harris was born on April 2, 1947, in Birmingham, Alabama, but she grew up in the Maryland and Virginia suburbs of Washington, D.C. and in North Carolina. Her father was in the Marine Corps, and her family moved often, though never back to the Deep South. Harris has recollected that her older brother liked country music much more than she did; her own musical preferences included folk and pop/rock. As a teenager she was a cheerleader who was a bright student; she graduated high school with a 4.0, walked valedictorian, and was a member of the honors society, the Beta Club. Musically, she hated piano lessons, played saxophone in her high school marching band, and dutifully went to clarinet lessons. Instead of music, her first love was drama, and she joined the Drama Club with aspirations of becoming an actress. During a year and a half of studies at the University of North Carolina on drama scholarship, Harris discovered performance singing at the local club, the Red Door, where she was paid ten bucks a night. After dropping out of UNC and giving up her dream of acting, she took off for New York City in search of the counterculture. Like so many other young people, she drifted to Greenwich Village, where she sang country and folk music--often with friend Mike Williams--in coffeehouses and nightclubs. She said to Timothy White of Billboard about the record executives that heard and rejected her, "I had a pretty interesting repertoire, but it went right over their heads. They didn't have a clue." In 1970, she and her first husband moved to Nashville to try their luck in the country format. She failed to become a hit there, and her marriage dissolved. With a newborn baby to care for, she returned to her parents' home in Maryland and began singing at clubs in Washington, D.C. Her performances with a band she pulled together, at the Red Fox Inn and the Cellar Door--in between waitressing--were hailed by Washington audiences that were already becoming known for a special receptivity to country-folk-bluegrass blends. After getting a manager and signing with Jubilee Records for her first record, Gliding Bird, Harris met Gram Parsons in Washington in 1972. The young Parsons, formerly with the Byrds, was a primary force in the burgeoning country-rock movement. He was so impressed with Harris' voice and delivery that he invited her to join him and his band, the Fallen Angels, in Los Angeles to sing backup on his first solo album. Harris was delighted by the offer, and over the ensuing two years she became Parson's protege, learning from him the special roots of country and honky-tonk music and developing from a "serious folkie" into a country/rock-lover. "It was an ear-opening period for me," Harris told Newsweek. "I'd always liked Hank Williams and Buck Owens, but with Gram I discovered that country music was a natural form of singing for me." On September 19, 1973, Parsons died of a heart attack, brought on by a mixture of tequila and morphine. Left to her own resources and carrying the torch of "Cosmic American music" alone, Harris formed the Angel Band and started playing the Red Fox Inn the way Parsons had taught her. About her career, she says, "'It was Gram who said we should be singing traditional country. He understood that it belonged with rock & roll. I feel funny getting all the credit when all I've been doing is carrying on the music I thought Gram would have done," according to Vicki Jo Radovsky of Entertainment Weekly. Harris signed with Warner Bros. Records. There she was paired with Brian Ahern, a gifted producer who gladly followed her natural tendencies not to strive for a pop sound and help her realize her European audience. In a short time after their first release, Pieces of the Sky, Harris was climbing the country charts with hits like the Louvin Brothers' "If I Could Only Win Your Love," A.P. Carter's "Hello, Stranger," and Buck Owens' "Together Again." Harris and Ahern were married in 1977. Harris formed her Hot Band in the late 1970s after the success of Pieces of the Sky to release Elite Hotel, which secured a Grammy Award and had number one success. The Hot Band became legendary over the years, starting the careers of musicians such as Vince Gill, Ronny Skaggs, Albert Lee and Rodney Crowell. For many years Harris worked out of Los Angeles in studios she built with Ahern. When that marriage ended, she returned to Nashville and based herself there. Then another marriage to Paul Kennerley--a Grammy Award-winning songwriter who helped her with The Ballad of Sally Rose--dissolved. Harris had by this time truly achieved success by following her own formula; by surrounding herself with a fine, distinctive backup band, by recording a quaint mixture of traditional, modern, and original tunes, and by presenting them all in a fine voice. "Even though my records don't go platinum," she said, "and I'm not a household word, I can do basically what I want, and get the same number of people to buy the records. That gives me a leverage to be able to experiment, and be able to do what I want. I'm very grateful for that. I really am aware of how important that is, to be able to enjoy what I do." As Harris has maintained throughout her career and repeated to Jerome, "You've got to shake things up, flex new muscles to where it's spontaneous and exciting again." She did just that by dropping the Hot Band and taking on an acoustic/blue-grass band named the Nash Ramblers in 1990. They quickly made their fame with an album recorded at the location of the original Grand Ole Opry, by then a dusty, neglected building. Their album, At the Ryman, served as the symbolic beginning for the revival of downtown Nashville and of the old Ryman building itself. Soon after, she was back in the studio and winning more Grammys, including one for her experimental work on Wrecking Ball. She left Elektra/Asylum to gain more freedom and gathered another band, called Spyboy, for a tour. The album Spyboy was released to fulfill an obligation to Elektra. Critics generally agree that Harris recorded two "masterworks." The first is Roses in the Snow, a work from the early 1980s that is decidedly bluegrass in flavor. With its acoustic accompaniments and traditional songs, Roses in the Snowharkens back to the work of the Carter Family, Ralph Stanley, and Flatt & Scruggs; it was a surprise commercial success for Harris. Her other outstanding accomplishment was the "country opera" album The Ballad of Sally Rose, a theme piece for which Harris wrote the lyrics herself. Based loosely on Harris' own life, The Ballad of Sally Rose follows a woman singer through the heights and depths of her career. In Stereo Review, Nash observes that the work "carries a desperation, a smoldering, aching passion to connect with the poignant realities that live in the heart and not just the head." Harris may have shown an unusual dedication to country music, but she also had an ear honed by folk and rock; she and Ahern recorded a trove of offbeat songs such as "Poncho and Lefty," by Townes Van Zandt, "The Boxer," by Paul Simon, and tunes by the Beatles and Bruce Springsteen. She has sung with the likes of Bob Dylan--as well as countless other respected rock and country stars--but has always gone her own way in the end. She jokes of the time she released Blue Kentucky Girl, and the record company recalled the cardboard cutouts of Harris in cowboy boots and hat which they had distributed for marketing. She didn't exactly fit into the country niche, and often hasn't. Kentucky Girl won a Grammy Award, however. In 1995, Harris released Wrecking Ball, which was considered to be her most experimental album. It featured songs by Jimi Hendrix, Bob Dylan, and Neil Young, who also sings along. Wrecking Ball was produced by Daniel Parsons of "atmospheric work" fame with U2, Peter Gabriel, and Bob Dylan. On her impressive Duets compilation, she is featured with Parsons, Roy Orbison, George Jones, and John Denver. With Cowgirl's Prayer, she returned to folk. When she did a bluegrass album, the critics sang a dirge. She said to White, "There was another part of me that said, 'If I can't sustain an artistic statement that I believe in, then if my career's over--it's over. 'Cause this is what I have to say right now." With three decades as a musician, nine Grammy Awards, nine gold records (and the multiplatinum Trio), and more than 20 albums in all, Harris has created an impressive career. But numbers alone do not do Harris justice. "Harris has an impeccable ear and loads of integrity, but that's just the icing on her cool cake," stated Entertainment Weekly's Vicki Jo Radovsky. Critics maintain that Harris "has changed American popular music.... She has both preserved and deepened this nation's awareness of its vital roots music" according to Timothy White in Billboard. But for her fans, it's not all about "quietly confounding the rhinestone regulars of country music," as Entertainment Weekly's Jeff Gordinier put it. "Emmy" is an icon. In the words of Roy Wunsch, as quoted by Jerome, "Emmy is one of the sounds that is going to live forever." Harris released Stumble into Grace, her follow-up to Red Dirt Girl, in 2003. Like its predecessor, it contained mostly self-penned material. In 2004, Harris led the Sweet Harmony Traveling Revue tour with Gillian Welch, David Rawlings, Buddy Miller and Patty Griffin. They performed singly and together and swapped instruments. All the Roadrunning, an album of collaborations with former Dire Straits frontman Mark Knopfler, was released in April 2006 and supported by a tour of Europe and the US. The album was a commercial success, reaching #8 in the UK and #17 in the US. Selections recorded during the All the Roadrunning tour performance at the Gibson Amphitheatre were released as a CD/DVD package titled Real Live Roadrunning in November 2006. A solo album, All I Intended to Be, was released on June 10, 2008, to critical acclaim. Contributors include Buddy Miller, the McGarrigle sisters, Vince Gill, Phil Madeira, and Dolly Parton. She toured with an ensemble she dubbed the Red Dirt Boys, featuring Phil Madeira on accordion, guitar, and keyboards, Colin Linden on guitar and banjo, Rickie Simpkins on mandolin and fiddle, Chris Donohue on bass, and Bryan Owings on drums. In 2010, Harris regrouped with the latest version of the Red Dirt Boys—Madeira, Owings, Donohue, and Simpkins—for Lilith Fair summer dates and a scheduled US autumn tour. -Gliding Bird , Jubilee, 1969. -Pieces of the Sky , Reprise, 1975. -Elite Hotel , Reprise, 1975. -Luxury Liner , Warner Bros., 1977. -Quarter Moon in a Ten-Cent Town , Warner Bros., 1978. -Profile: The Best of Emmylou Harris (compilation), Warner Bros., 1978. -Blue Kentucky Girl , Warner Bros., 1980. -Roses in the Snow , Warner Bros., 1980. -Light of the Stable , Warner Bros., 1980. -Cimarron , Warner Bros., 1981. -Evangeline , Warner Bros., 1981. -Last Date , Warner Bros., 1982. -White Shoes , Warner Bros., 1983. -The Ballad of Sally Rose , Warner Bros., 1985. -Thirteen , Warner Bros., 1986. -Profile II: The Best of Emmylou Harris (compilation), Warner Bros., 1984. -Angel Band , Warner Bros., 1987. -Brand New Dance , Reprise, 1990. -At the Ryman (live), Reprise, 1992. -Cowgirl's Prayer , Asylum, 1993. -Songs of the West , Warner Bros., 1994. -Wrecking Ball , Asylum, 1995. -Red Dirt Girl , Nonesuch, 2000. -Anthology: The Warner-Reprise Years (compilation), Rhine, 2001. -GP , Warner Bros., 1972. -Grievous Angels , Warner Bros., 1973. -(With Dolly Parton and Linda Ronstadt) Trio , Warner Bros., 1987. -(With Dolly Parton and Linda Ronstadt) Trio II , Elektra/Asylum, 1998. -(With Dolly Parton) Western Wall: The Tuscon Sessions , Elektra, 1999. 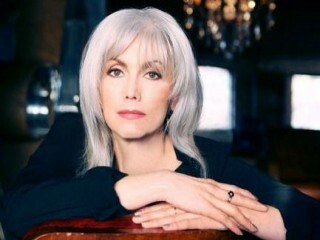 View the full website biography of Emmylou Harris.